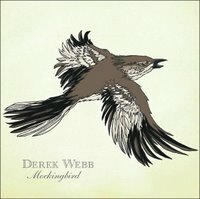 When I got home from the Derek Webb concert on Tuesday night, I shot off a blog that was in protest of what I thought was an overtly left-wing political message on Webb’s new album “Mockingbird.” But I later deleted what I wrote because I came to the conclusion that Derek’s message actually deserved a little more serious consideration than I had given it. So that is why this has turned into a three part series. I kid you not. Many in the room cheered at the end of line three. There was a real sense among many who were there that Derek’s protest was their protest. As I was watching the people cheer (especially those near the front of the stage), I wondered who Derek was talking about. After all, who would actually say that Jesus was a white, middle-class Republican? Was this a fair charge? Not even the worst hacks and lackeys of the political right would say something as crass as that. But as I reflected on his comments after the concert, I realized that he was being hyperbolic, and I was interpreting his words in an overly literal way. My response was kind of like the Jews’ response to Jesus in John 6 when he told them that they needed to drink his blood and eat his flesh. Their overly literal interpretation was a result of their animus against Jesus. A more sympathetic listener would not have pressed the literal sense of His words so as to make the charge that Jesus advocated cannibalism. We all need to make room for hyperbolic statements—especially since Jesus Himself spoke this way all the time (e.g., Mt 5:29-30; Lk 14:26). I want to receive the hyperboles of Jesus, and I want to be open to receive them from someone else when they are in line with the truth of the gospel. And the truth is that Derek has expressed great insight into some of the besetting sins of American evangelicalism. So I think we would all do well to listen to some of the things Derek is saying. First, Derek is defying the apparent alliance between evangelical Christians and the Republican Party. Appearances do not always match reality, but they often do reflect correlations. And the fact is that culturally conservative people gravitate toward the Republican candidates. To the extent, however, that any Christians think that the Republicans or the Democrats will usher in the kingdom of God, to that extent they are deeply and profoundly mistaken. So Derek asks a great question. Have evangelicals become mere lackeys of a secular political party? If so, they have sold out their mission. I am right on board with Derek on this one. Second, Derek is challenging evangelicals who confuse Christianity with American nationalism. Anyone who has ever sat through patriotic displays and ceremonies during what is supposed to be Christian worship knows that this particular critique is right on target. Just last year, I sat in a patriotic service in an evangelical church in which the worship leader led the congregation to sing hymns praising America. A military color guard marched the American flag down the center aisle while the church orchestra played each of the anthems of the five military branches. There was nothing distinctly Christian about the whole display, but it was nationalistic. I thought it was shameful. My irritation was exacerbated because I had just welcomed a family of visitors from Sri Lanka before the service began. I was embarrassed and ashamed that these dear brothers and sisters from abroad were asked not to lift up Christ, but to praise America. I think we would all do well to hear Derek’s challenge in this respect. Third, Derek is confronting the legalism that persists among too many evangelicals. Of course this is the main point of the song “New Law.” While evangelicals will readily affirm that keeping the Old Testament law will not save anyone, they all too often adopt new laws and keep them in a prideful attempt to feel better about themselves. In “Rich Young Ruler,” Derek makes the point that it is precisely this kind of legalism that makes people feel self-assured about their standing with God, even though their materialism and idols betray that Jesus doesn’t have their allegiance at all. People become so proud of their ability to keep their new law, they don’t even realize they aren’t following the law of Christ (Galatians 6:2). This is also an apt word from Derek. There is much good in what Derek is saying. I am praying for the Lord to let me hear it so that I can change. I am also praying that the wider evangelical community will listen to it because too many churches are missing the mark in these areas. Yet even for all the good that there is on “Mockingbird,” I still think there are some things that aren’t so good. I’ll address those in Part 3. Denny,Thanks for your comments. I greatly appreciate a man's ability to resist defensive remarks and acknowledge the helpful and biblical intuitions found in those we don't necessarily see eye to eye. As to your first point, I do believe the evangelical church is profoundly naive to forget that the Republican party is after their votes and money and they will say and do much (not necessariy anything) to attract them. Not only that, neither party is concerned with what we're concerned with; that is the unrelenting spread of the Gospel and the manifestation of Kingdom life. Great insights into the parts of the album that present some real challenges for us to think about (and sing about?). I imagine that your third installment will dismantle some of Webb's other songs, like "My Enemies Are Men Like Me," via a healthy dose of Augustine's Just War Theory. Webb does provide an oversimplification of the issues without a doubt, we should challenge him to think about these issues as he's challenged us to think about others. Remember even the great thinker, theologian, and preacher Augustine issued his Retractions before his life was over, it's not too late for any of us to reconsider. Looking forward to your third installment! I enjoy reading your blog, and I was very disappointed with your previous posts about Webb. Therefore, I am grateful for this post. Unfortunately, Derek Webb's line 3 is perhaps more literal than one might think. I actually know of a potential staff member interviewing for a ministry position and one of the leading deacons said, "Now Mr. x, you are a Republican, aren't you?" thanks for the insight and reflections. Dr. Burk,Very helpful series. I have only recently begun listening to this CD and appreciate your help in thinking through the issues Webb presents. denny, i appreciated your sensitive reflections on this important issue of christianity and the GOP. in may a book on this issue by g. boyd is coming out on this issue via zondervan. the impetus for the book is stated on this interesting article on christianity today. Good insight Denny. My only addition is to read in light of the media… it is song not a theological treatise. So your understading is very well stated. I personally enjoyed a few of the songs, but it just didn't hit me as hard as some of his past songs. And about the "Red" party, I remember a reading/listen to someone who was bashing a "Blue" brother.